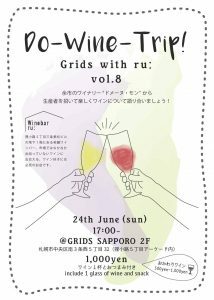 Both situated in Tanuki Koji, 【Winebar ruː】 and GRIDS SAPPORO co – host a monthly wine event. We also run a slide show of the wineries in Hokkaido! This event is for anyone to join in and enjoy whether you are staying with us at GRIDS, a citizen of Sapporo or those who come to Sapporo only to participate in the event. We will be waiting with the corks already popped! (* ^^ *)!